This year there’s been a lot of heated discussion within the online surf community about the representation of female surfers by their sponsors and in the media. Coco and her naked surf, Anastasia’s twerking and as always Alana and well what can you say, she is always guaranteed to divide opinion. 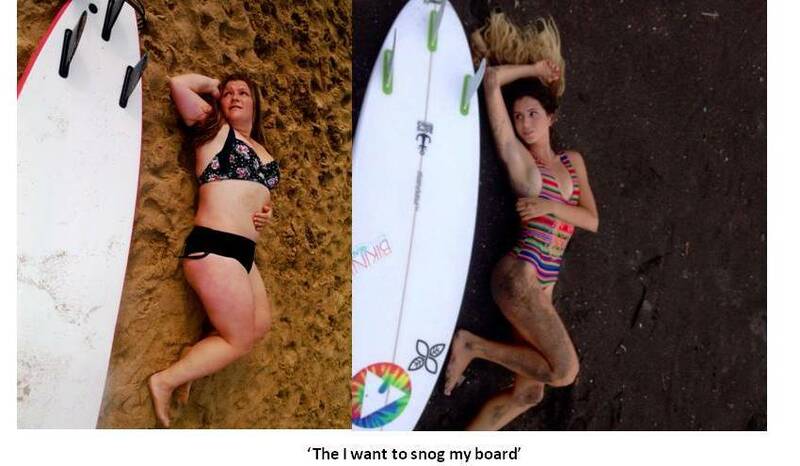 The girls have been criticised for doing steamy photo shoots and the negative influence this could have on young surf girls and many see this objectification of female surfers as undermining their talent as actual surfers. Why aren’t they shown ripping in the water? Others say leave them to it and stop judging as it allows them to continue surfing. All I know is that I cannot relate to this created image at all . I’m older, rounder and struggling to progress as I can’t surf as often as I’d like. I’m excluded by most brands due to their sizing which to me is madness, I’m not even that big, I’m a UK size 16 and there must be 1000’s of women like me who have money to spend. Luckily I’m older now and with the confidence that comes with maturity(41) this exclusion does not affect me so much as it makes me grumpy when I’m shopping for board shorts. 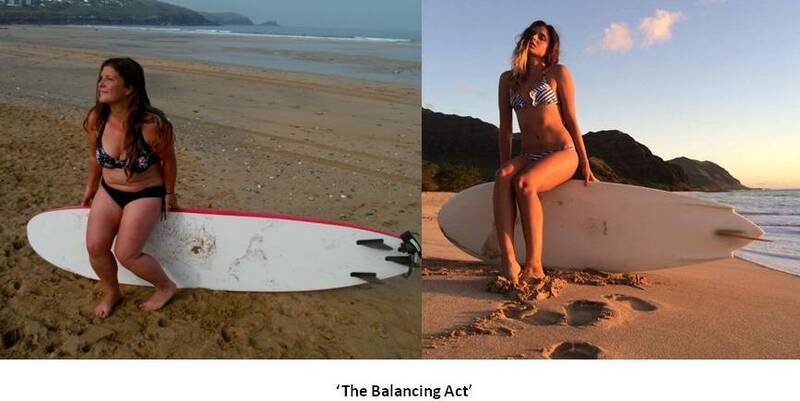 I don’t blame the girls themselves, they have to conform to the surf girl template if they want sponsorship that allows them to surf professionally. So , I wondered how they felt about doing it and then I started thinking imagine if I did. The thought of it made me really laugh to myself and well, that’s where it started. I employed my mate as chief (and only) photographer, and we headed down to Fistral on a sunny morning last week during our holiday there. Of course we had no hair and makeup or styling but, for a laugh we set about mirroring some of the shots of the beautiful, famous surf girls. I thought this was purely a comedy project with maybe a little message to women about body confidence and that it would produce some Benny Hill type giggles . I was surprised to find that it was a little more meaningful than I imagined it to be. It was so cold I forgot to do my hand on the back of my head and refused to go back in without a wetsuit! Clearly I’m a chunky monkey next to our girl! I’m clearly a bigger girl, I have lost a fair bit of timber since I started surfing 18 months ago in an effort to get fit and strong and to improve my performance and I still have some way to go. I’m about as far away from the gorgeous blond surf girl image you can get. I thought I’d feel insecure about sharing these pictures but, to my suprise it’s been quite the opposite and this is a huge breakthorugh for me and my confidence. I look at the first one, ‘Balancing Act’ and all I see is a snapshot of happiness. There’s a memory of an amazingly, fun, surf session we had right after this picture was taken and how much laughing we did in the water that day. It’s a reminder how utterly content I was being by the sea, spending time with my best girl friend. I don’t look at my chunky little legs or folds on my wobbly tummy. I look at my face and the light in my eyes, I’m so happy here and I feel beautiful. I’m at the beach and about to do the thing I love the most in the world and it’s written all over my face. I have never in my life seen that in myself until I saw this photograph. I realised that I absolutely love these pictures. I’m not embarrassed about my body even though I’m far from perfect. I’m too consumed by surfing to care. I’m strong, I’m healthy and I’m fit. I can lift heavy weights, run 13.2 miles nonstop and surf a long session without having spaghetti arms for the next 48 hours. I’m proud of me. This is the body that lets me surf and run and do the things that make me happy so I blooming well should look after it and love it. If surf brands aiming at female consumers want a blurb to attract female customers it should be something like this; no matter your size or shape get out there and live your life, move more, strive to improve your health and wellbeing, do stuff, scream with excitement, swallow seawater and eat sand and laugh until it hurts. Be kind, encouraging and supportive to other girls and women and help each other , watch the sun go down, watch the sun come up, be outside as much as possible, stop wasting time trying to be perfect and start spending time creating perfect moments. Maybe a little cheesy but, so true! haha! More over friendly seal than mermaid!! Great idea and amazing message. I’d much rather my daughter had you as her iconic image of a woman, enjoying life and loving herself, than trying to attain that impossible ‘perfect’ image. Ha ha. That’s so funny! I’m inviting you to come and have laughs and surf with real sharks in Cape Town, bugger Newquay! All of the women I surf with are everything the surf industry has left out – older than 40 and exceptionally silly, but we can surf! This is fantastic. The photo of you sitting on the surf board really does capture a great look on your face. I love your quote: I have never in my life seen that in myself until I saw this photograph. Lots of people are still searching for that moment! Go girl!! !